The Double K Hoof Polishing attachment for the 401 Power Clipper is an excellent choice for sanding hooves to a smooth finish. Perfect for prepping the hooves of show horses before applying polish. The handpiece attaches quickly to any Double K cable driven clipper by using the quick detach feature to remove the clipper handpiece from the cable and simply snapping the 504-HP on to the cable. The handpiece chuck (receptacle) opens with a convenient chuck key (included) and easily accepts the shaft of the polishing/sanding wheels. 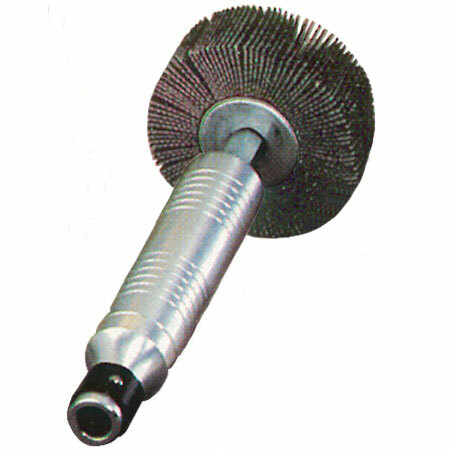 The polishing/sanding wheels are available in grades of fine,medium or coarse. This handpiece can also convert to a leather or silver polishing tool by using the cotton polishing wheel. It is very effective for cleaning and polishing leather and tack, as well as polishing silver embellishments on saddles, bridles, halters, etc. Handpiece dimensions (without attachments): 5-3/16” long, 1” diameter, weight 5.85 oz.